When I was eight years old and fresh from Illinois, a flatland state, and plunked down in Oregon where hills abound, and the Cascade mountain Range runs right smack dab down its middle, I was in an almost perpetual state of awe. Mt. Hood was visible from almost everywhere in the little town where I grew up, and then if that wasn’t enough, one day we drove down the Columbia River Gorge and visited Multnomah Falls. I had never seen anything that big, that tall, or that much water pouring over a cliff. The falls and I have had a love-affair going ever since. Yes, I know I have blogged about the falls before, but I have to tell you I walked to the bridge yesterday. I felt the roar of the water coursing over the edge of a 620-foot cliff—louder than I had ever heard it, and more water than I had ever seen there before. Mist flew from the falls, and rain was drizzling as well, but it was not cold, so I took off my hood and let the water fall on my head and the mist spritz my face. And that was me, who is fussy about keeping my head warm. It was tremendous. When I first exited my car in the parking lot at the Falls yesterday, people smiled at me. The excitement from the falls must have reached across the road, and through a pedestrian tunnel that ran under it. I figured all those positive ions from rushing water pumped people up. It was a trip to the mountain as I speak about in The Wisdom Seekers, a boon, from a trip. Joseph Campbell speaks of the heroes journey and at the completion, he takes home a boon, a treasure from the trip. It is something to benefit the village back home. You know we are all heroes in our own journey. And while I’m not sure this can benefit my village, it is an experience I share. In coming home I felt a let-down as often happens with trips, but this morning in telling you, I feel uplifted. I know this is the stuff of life. Abraham speaks of a Rampage of Appreciation, meaning to bombard your life and the Universe with how appreciative you are. You know how easy it is to say what’s wrong with the world. It is easy to complain and rant and rave. We are geared to see what’s wrong and must be taught to notice what’s right. It’s that old negative bias again that gets us. One of my readers wanted to know more about the mind-body connection, and I am no authority on that, but I can say this APPRECIATE. Be grateful. It will boost both your mind and your body. You might even have a better immune system because of it. Do you think maybe I’m talking to myself? Well, I am, but I hope you join me. I know people search the web for answers. They tune into blogs that answer questions, and mainly it is about being successful, about blogging, how to sell, how to make money, and how to cure something. If we all stood around smiling we wouldn’t have anything to talk about, complain about, or rail against. But we would be happy. I have been watching a Netflix series called, “One Strange Rock” narrated by Will Smith, and contributed to by eight astronauts who have spent time on the Space Station. Talk about looking down and appreciating their home. What a view. I believe the first episode impacted me the most. It was about Oxygen. (O2) You know that stuff that we must breathe to live. And here the earth manufactures it for us. And that thin-film we call atmosphere is so delicate we can climb a mountain and be in the outer limits of it. Talk about feeling vulnerable. We have heard that the rain forests are the lungs of the earth, well they are, but not in the way that we think. All the oxygen that is created by the trees in the rain forest stay there. Enough animals live in the rain forest to use it. Water is drawn from the soil into the roots of the trees. The water travels up the trunks, limbs and into the leaves. Have you seen those little droplets of water that seep from a leaf? You might think it is water on the leaf, but its water from inside seeping out. That is the cell’s transpiration. Those droplets leap from the leaves into the air and are caught by with the wind. They called it a river in the sky. That sky river carries that moisture over to the desert where it picks up dust. That dust is carried to the ocean and dropped where it fertilizes the diatoms that live there. The diatoms gobble it up, make more of themselves, and become photosynthetic, and give off oxygen—more oxygen than the rain forest produces. When I was snorkeling in Hawaii I saw a big fish swim up to a rock and take an audible crunch. I called them Rock Crunchers. Well, I learned from another episode of One Strange Rock, that those so-called Rock Crunchers, are Parrotfish, and they chew up coral. Parrotfish eat coral and poop out sand, and they can produce a ton of it a year. 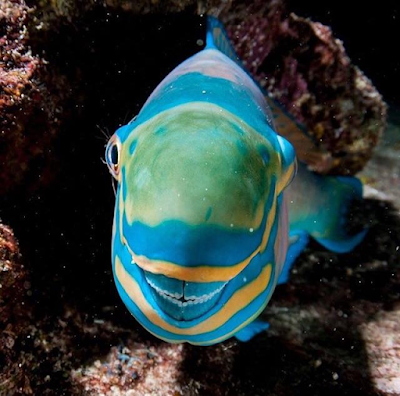 So, the next time you are lounging on an island possibly made up of sand, or Parrotfish poop, as you squish your toes into the sand and watch the kids make sand castles, you can thank the Parrotfishes. Now look at that face. PS. I tried to download a video and it failed. If interested in a cruise by the Falls with music, check out Instagram joycedavis747. It has the roar of the falls, plus a music tape that was playing in my recorder, except that it cut off before Ethyl Merman began to sing, Everything's Coming Up Roses.